Obviously timed to the first day of Oshkosh Wisconsin’s AirventureRichard Branson’s Virgin Galactic opened their Mojave Desert hanger for a media announcement today which gave a peak at what their aerospace engineers have been working on — previous posts here and here. 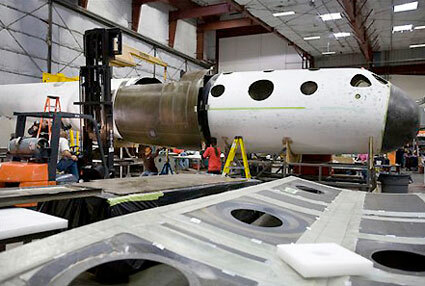 The spaceship which is designed to launch their spaceship to the 62 mile mark for a mere 5-minute flight in space. 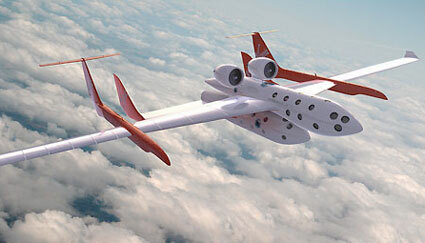 The photo above is an updated Artist concept drawing of Virgin Galactic’s “mother ship” used to launch the rocket powered spaceship into space — see my photos of Spaceship One at Airventure a few years ago.